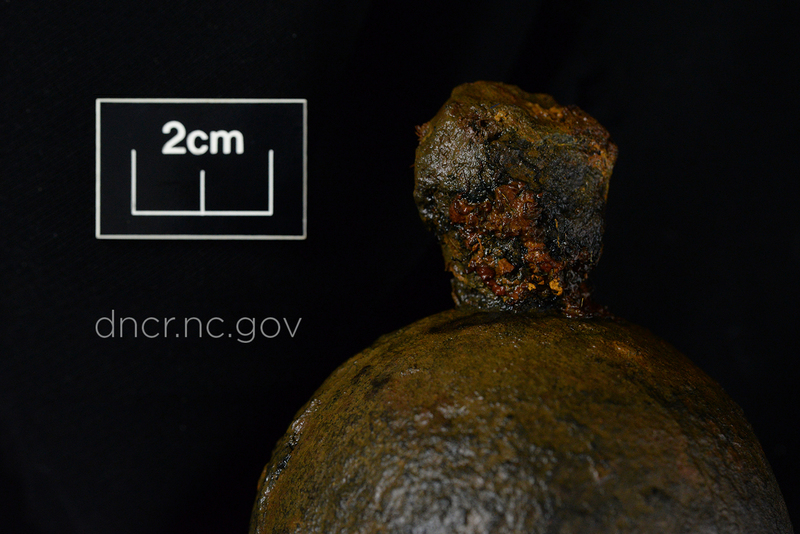 With 30 cannon, hundreds of cannonballs, and hundreds of thousands of pieces of lead shot so far recovered from Queen Anne’s Revenge it goes without saying that Blackbeard’s ship was well armed. This shouldn’t be surprising given the reputation that Blackbeard built for himself in his relatively short pirating career. What better way to crush your enemies, see them driven before you, and hear the lamentations of their women than to be armed to the teeth. Or in this case, armed with grenades. After all, what was tossed over the side of a pirate ship might go boom! Grenades were first used in the late fifteenth or early sixteenth centuries and were initially earthenware or glass, as opposed to cast iron. These were filled with powder and thrown by hand. The iron projectiles of the eighteenth century were cast in molds and filled with a similarly explosive mixture of saltpeter (potassium nitrate), Sulphur, and finely ground charcoal. Ignited by a slow burning cloth or paper fuse threaded through a wooden plug, grenades could be thrown roughly 30 meters, further if fired using a lightweight mortar, and were deployed to devastating effect. These would explode, causing confusion and terror in addition to the concussive and shrapnel damage caused by the detonation. Grenades may have been stored in wooden, lead-lined crates, like those found onboard HMS Invincible, or inside barrels with hinged lids. 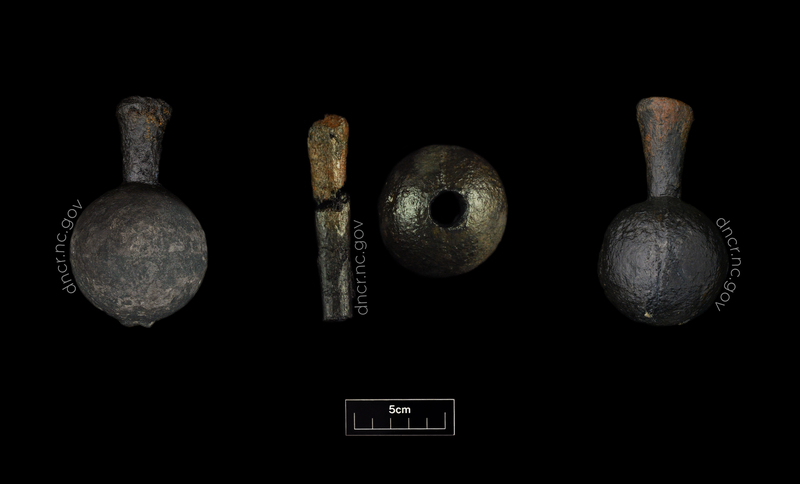 With eighteenth-century grenades, as with modern grenades, timing could be an issue. A variety of historical sources provide directions for handling grenades. Too little time between lighting the fuse and your ensuing explosion could result in your pirate grenadier becoming the unintended recipient, inflicting damage intended for the enemy on himself. A delayed fuse however, meant giving your enemies time to lob it back at you! One early eighteenth-century source suggests a deterrent: apply a thick mixture of turpentine, brimstone, pitch, and candle tallow mixed with gunpowder to the exterior of the shell, adhering paper dipped in dissolved saltpeter to the outside of the grenade. When the grenade is lit the paper catches fire as well, burning “so terrible that the most daring fellow will not venture to return it.” Simply put: when in doubt, add more fire. Over two dozen grenades have been found on Queen Anne’s Revenge, primarily in the stern of the vessel and near cannon. Future excavation and recovery may reveal grenades in the bow of the ship as well. Of those undergoing conservation, one of the grenades was found with fabric and tar on top of the fuse, indicating a grenade ready for use as opposed to stored. Another was found with a casting flaw; a lead repair had been done on the underside to fill an undesired hole in the bottom of the grenade. Twelve grenades are still in concretion. Similar grenades have been found on contemporary shipwrecks including Whydah, Henrietta Marie, HMS Invincible, and HMS Culloden. -Boudriot, Jean. L’Artillerie De Mar: Marine Française 1650-1850. Paris: Ancre, 1992. -Mountaine, William. The Seaman’s Vade-Mecum, and Defensive War by Sea. London: W. Mount and T. Page, 1744. -Norton, Robert. The Gunners Dialogue: With the Art of Great Artillery. London: Iohn Tap, 1643. -Park, Robert. Defensive War by Sea. London: Rich. Moum and Tho. Page, 1704. 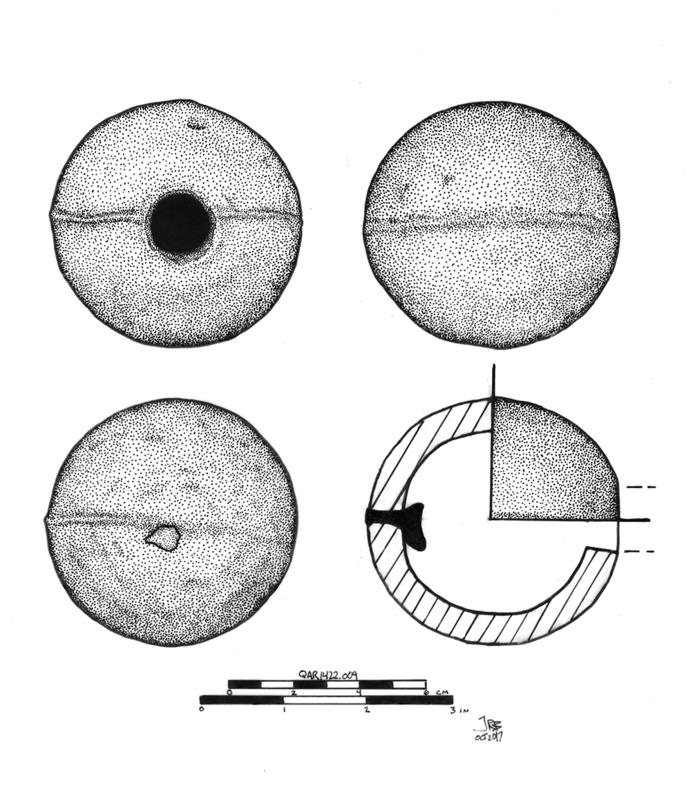 -Grenades and fuse plugs from the QAR site. Image by NC Department of Natural and Cultural Resources. -Grenade from the QAR site. Image by NC Department of Natural and Cultural Resources. -Illustration of grenade from the QAR site. Image by NC Department of Natural and Cultural Resources.